Residents of Atlanta, Georgia know volleyball courts from Southwest Greens offer many advantages. Our unique flooring designed for volleyball courts won’t stain clothes, is safe to dive on and is maintenance free, so you rarely need repair work. Our professionals are experts in the design, construction and installation of synthetic turf for volleyball courts, so let us build one for you today! We want to give residents of Atlanta an indoor volleyball court that rivals the finest courts they have played on in the past. We are proud to offer the highest quality synthetic material for our courts. If you live in Atlanta, an outdoor volleyball court from Southwest Greens can be yours affordably and in a timely fashion! Our professional builders can construct and install a volleyball court for residents of Atlanta as well as those of Duluth, Lilburn, Forsyth, Peachtree City and more. 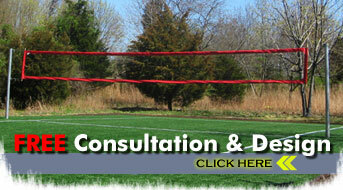 Let us begin construction on your very own personal volleyball court today! We are proud to offer volleyball courts for both indoor and outdoor applications. When you play on our courts, you'll find it safe to dive on a surface that keeps clothes free of grass stains. Our courts are custom designed to fit your yard and don't require repairs, plus construction and installation by our experienced builders is always quick and easy. Serve, set, and spike on a custom volleyball court from Southwest Greens. Our courts feature synthetic flooring that will keep you safe and let you enjoy the game you love at a high level.